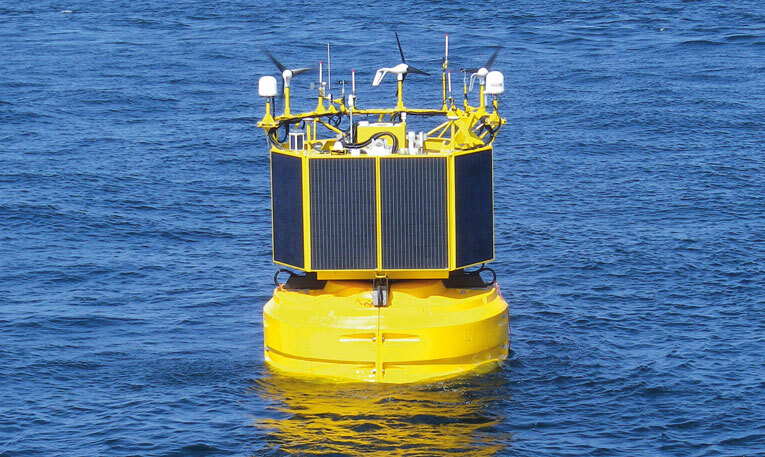 The FLiDAR measurement buoy represents a major breakthrough for the offshore wind industry, enabling major cost reductions for offshore wind resource assessments. Development companies considering the deployment of new marine renewable technologies such as offshore wind, wave and tidal energy will find the FLiDAR very useful. It can be deployed in one day and delivers highly accurate data throughout the project development, with real-time data access. It has been proven to measure wind potential with an accuracy equivalent to fixed offshore met masts, regardless of the sea state. The business concept of FLiDAR is based on a rental model with data service agreement, minimising financial risk and maximising flexibility for the customer. As quality, dependability and full-time availability are key aspects, the developers of FLiDAR turned to Navex Elektro and Mastervolt for the onboard energy supply. To ensure full-time operation at sea, long periods of autonomous power supply must be guaranteed, even when solar and wind power generation are far below average. All power needs to be supplied at either 12 V or 24 V DC. Measuring and controlling all (redundant) onboard energy consumers and sources remotely, again to ensure full-time operation and, if necessary, timely service. A crucial decision for this application was the type of batteries to be used. Lithium Ion technology was chosen for its low weight, volume and, most importantly, extremely high ‘round-trip efficiency’. Storing energy in these batteries and subsequently using that same energy for the onboard consumers has an efficiency of > 90 %, meaning that energy losses are reduced by up to a factor of three compared to traditional batteries. To ensure the FLiDAR buoy will maintain its measurements and communication even during periods of cloudy days and little wind, it was decided to install two battery banks each of six MLI Ultra 24/5000s with a combined capacity of 60 kWh. This battery capacity means the buoy can operate for approx. two-week periods with no sun or wind at all, or a period of two months of average wind and no sun. To remotely monitor and control the various onboard energy sources and consumers, all necessary system information is combined using MasterBus. A combination of digital switching products and Tank Level Interfaces (measuring current through a custom interface) ensures that all power flows are measured and switchable while environmental properties like temperature and humidity are also calculated. For redundancy purposes, the two battery banks can be separately switched by using 500 A latching relays controlled by Multipurpose Contact Output interfaces. 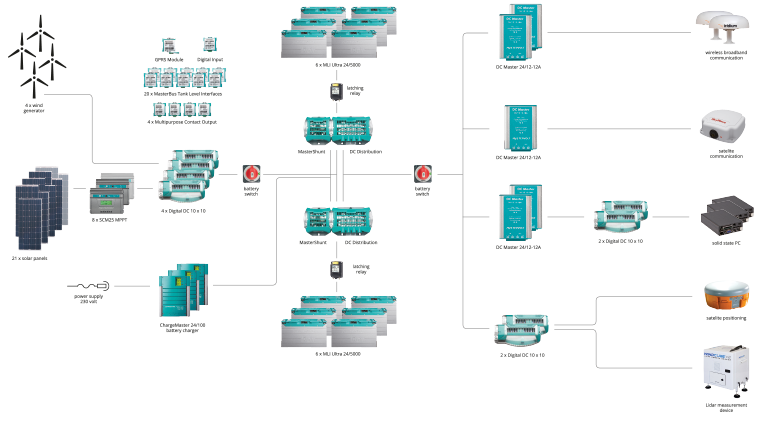 This can all be done remotely by the integration of a GPRS Module in the MasterBus system. The 24 V consumers are supplied directly by the batteries, a set of five DC Master 24/12 (DC-DC converters) convert the voltage to supply the 12 V consumers. The buoy can be plugged into the grid when not at sea, charging the MLI Ultra batteries through a set of ChargeMaster battery chargers. 8 x SCM25 MPPT solar charge regulator; to efficiently charge the Lithium Ion batteries via the solar panels.